Win Cash Prizes In The #HBBizClinic Series on Wednesdays. CONGRATULATIONS to the winners of #HBBizClinic Week 2 - Olorunfunmi Damilare Drey ORei won 20k cash prize and ChrisMartins Chinonso Biochris won a book on entrepreneurship titled "Cash Your Passion" (practical steps to making money form the things you love doing). . .
1. What type of business is the winner of the Next Titan season 3 into? 2. Which Heritage Bank account offers charges that won't shock you? 3. What SME award did Heritage Bank win recently? . . Didn't win this week, you can be a winner next week. The HB Business Clinic is open every Wednesday at at 12pm. 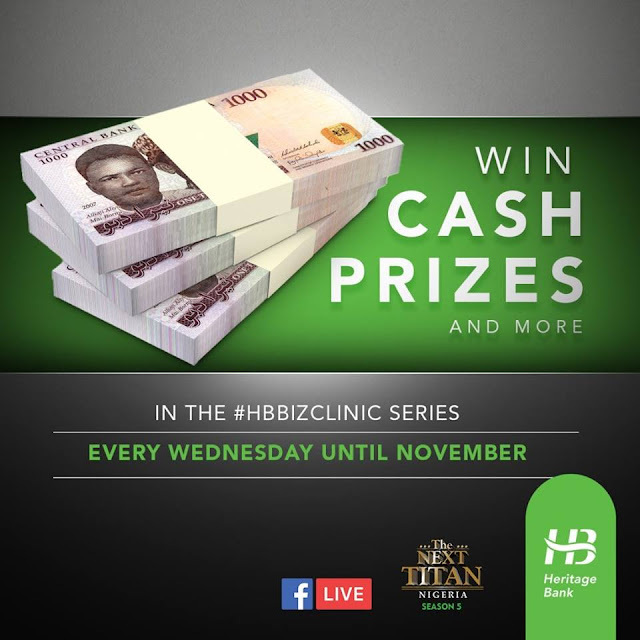 Note: Always visit Heritage Bank pages on WEDNESDAYs to participate and win.